From Nanjing we flew to Xian, pulled our luggage through the airport, stopped at a information booth, they made a call, someone came, pulled our bags to a taxi, in 45 minutes we were in front of our apartment 1 block from what is called the city center. We thought, this is too easy, this must be an extraordinary place. The next morning we found out what city center meant. There was a large, ancient, worshiping bell tower surrounded by a 4 lane rotary with 3 car lanes and one bike lane coming in and 3 car lanes and bike lanes going out in the north, south, east and west directions. 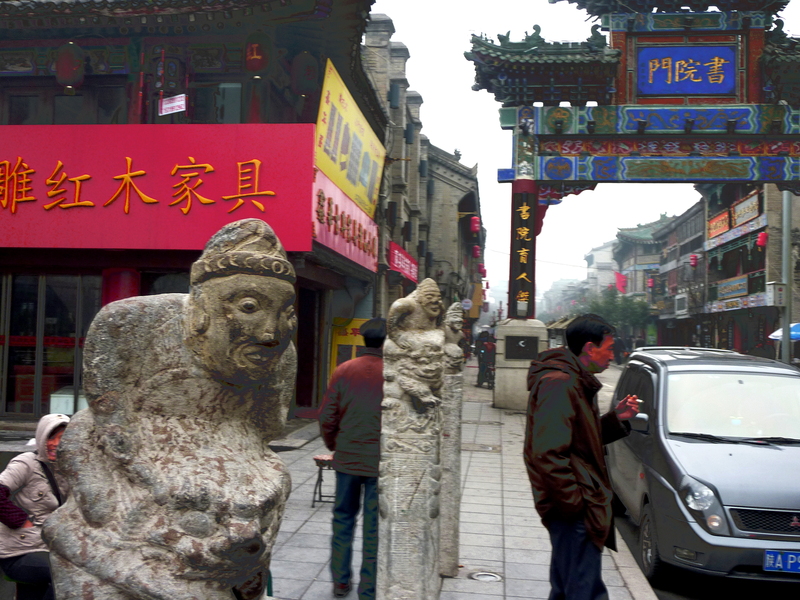 There was a mixture of old ancient buildings mixed with newer buildings of traditional Chinese architecture. You can’t imagine this mixture because the city has a history of 6000 years. There were again street underpasses that made it the only way to cross the hectic streets. The four N,S,E and West lanes lead to gates in a 30 foot wall that surrounds the city. Your location is referred to either as inside the wall or outside. Inside is approximately 15 blocks in diameter.The wall has a walkway on top. The southgate also has a tower right at the wall and is surrounded by the same type of rotary. The tower is the entrance to the wall walkway and one must traverse the heavy and continual rotary traffic to get to it. We stood 45 minutes our first day studying pedestrian crossing techniques, only too conclude you had to be lucky or Chinese to cross that traffic. From crossing other streets, we found you will be standing out in the road with buses, cars, and bikes passing within inches on both sides of you. Sitting in the front seat of a bus one day, our bus stopped in traffic for a women crossing the traffic pushing a pedal bike. She was boxed in because she was cut off on both sides by two car switching lanes toward each other in front of her. We went back a second day to walk the wall, but just marveled at the pedestrians crossing the rotary before we went off the main street into the side streets. The first day in Xian, it sleeted so exploring was limited because we are traveling in socked sandals, that the Chinese on the street are amused by, particularity the shoe shine women. The remaining four days were sunny and cold, but we walked many of the colorful back streets, which are full of all types of different shops and stores. and people. We ended up collecting 40kg of souvenirs that we could not travel with. So…we braved the postal service hesitantly because of our Nanjing PO experience with Yufeng and Hongxuan. I still can not figure out how envelopments do not stick together in the mail box after you brush on the glue out of a glue well to seal envelopes and adhere the stamp, there is always glue seeping out the edges. The main reason for the Xian visit was to get to the Terra Cotta warriors. We took local bus 611 out of town to the main bus station. There across from the bus station is the Central Rail station where we found bus 306 to the Terra Cotta warriors. What a scene the two stations are, travelers, vendors, hawkers, and hanger ons all mingling. The journey took 90 minutes not counting the wandering to find the correct buses and the gawking. The bus dropped us off (about 7 people) in a huge 90% empty parking lot. We saw a gigantic warrior statue and walked toward it. The ticket window was then easily visible and we started the trek up the newly built long entrance pathway to the warriors, not knowing what to expect. The archaeologists do not work in the winter time at the site and not many people visit, so there was hardy anyone there, whereas in the summer the crowds can be a million per day. The place is built for large crowds so it has huge open space. It is a little reminiscent of the the open space at the Albany Capital Plaza. There are 3 roofed pits all looking recently built in modern Chinese architecture. Each pit has a different warrior setting and each excavation is in a different stage of completion. 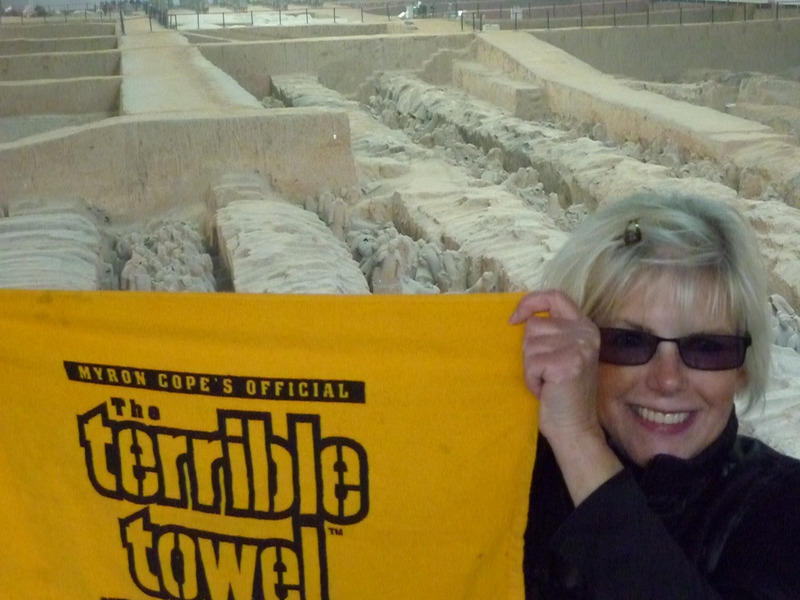 There also is a museum with different artifacts recovered including the only 2 manned horse chariots unearthed so far. From the museum tour it is a pretty easy conclusion that the Qin dynasty liked to make pottery and clay items and made a lot of it, around 2000 years ago. 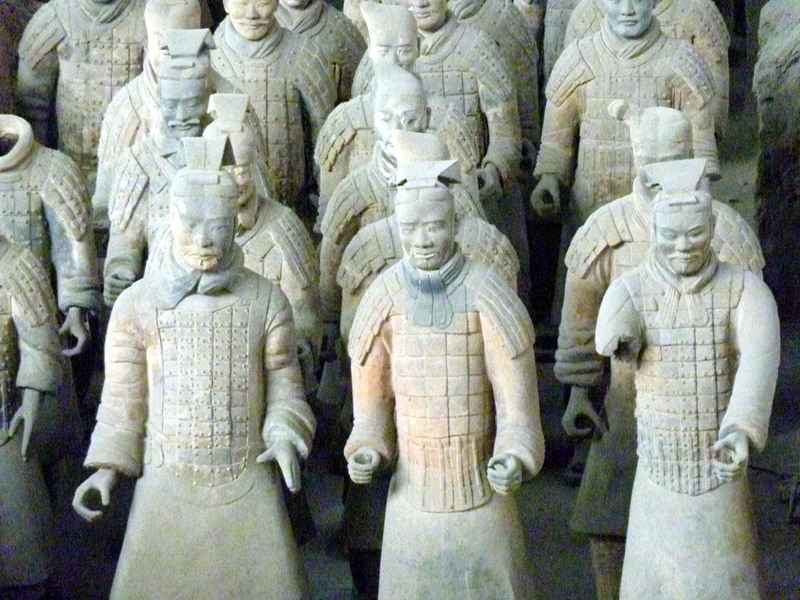 There are 10’s of thousands of artifacts, but its the warriors that are the most impressive particularly because they were lined up in formation to protect the dead emperor Qin. The existence of the warriors has always been known but the whereabouts was not until 1974. Two farmers in a small suburb of Xian were digging a well when they came upon some broken pottery pieces. The townspeople formulated two theories that either the pieces belonged to the legendary pottery people or were shrine pieces that would bring bad luck to the town. A local with a connection to state archaeologists concluded that further diggings should occur. Two years later it was determined that this was the sight of the tomb of Qin where the fabled Terra Cotta warriors should exist. In 1976 archaeological excavation started and today , my guess is in pit 1 the excavation is 20 % complete, pit 2 maybe 50%, and pit 3. 5%. Pit 1 is the most impressive because of thousands of warrior statues of only a few different ranks; kneeling archer, horsemen, swordsmen…have been put back together and are lined up facing the farmer’s well and behind them are soldiers in different states of unearthing. The walkway leading to and from the pit buildings is new and huge and more construction is going on all around the walkway. On each side of the walkway are newly opened stores, small restaurants, and stalls with hawkers all along the way making it impossible to leave without feeling you made the best deal for gifts back home. Don't let the season end against the Ratbirds! !